Keyboard Krumbs | The fascinating world of a middle aged American man. People still ask me if I miss my old job. Not really. Well, yes and no. Yes, it was always interesting and it was work I excelled at, but do it today? No thanks. But allow me to reminisce. Early in my career, I produced cheap local commercials and we were doing a spot for Halloween Hall in Ballston Spa. We’d done a lot of shooting in the store, but this season they had a unique new item they wanted to show off: an elaborate mummy costume. This would require a special shot that could only be done back in the studio. Our plan was for the mummy to emerge from the darkness into a beam of light — and to make it extra dramatic, we rented a smoke machine. Nothing makes things look cooler than a smoke machine. 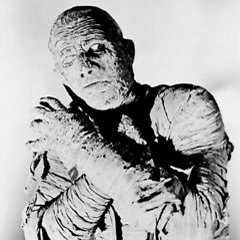 We were all set — but someone would have to swaddle themselves in this mummy suit. Normally, I’d persuade an intern to do this, but that semester we didn’t have one, so I wrapped myself up and went to work. It looked terrific — exactly as planned — and with the studio full of smoke, I got out there and lurched around doing my best Lon Chaney Jr.
That’s when the station’s chief engineer ran in screaming. Yes, we were in the same studio as used for the newscast, and in moments, a crew from engineering started disconnecting the hulking cameras and dragging them into the hallway. It should have been funny, me standing there in a mummy suit getting yelled at, but my blood ran cold. I skulked off to my office and waited to be fired. Later in the day, my boss, the director of sales, called me to his office. He said something like, “Hey, no more smoke machines in the studio,” and sent me on my way. That’s the day when I learned a valuable lesson: TV stations are not run by the engineering or news departments, they are run by sales. The only media literacy lesson you need is this: it’s a business — and if you think the media is biased, you’re right. They’re biased toward making money. The morning began with computer problems as the SD card reader was not reading. Hmph. There were a lot of solutions online and none of them worked — until this one turned up: blow air into the slot. With your mouth. OK, why not? It only took one sharp puff into the SD reader for the card to work when it was reinserted. Fixing this trouble impressed me so, that it was hard not to imagine spending my retirement working at the Apple store. That would be my specialty, blowing air into the openings in people’s computers. One could do worse. The Beatles White Album has been on my turntable since Christmas. The new remastered version was released in the fall, including my vinyl copy, a double album that’s nearly identical to the original release’s packaging. This evening, side one sounded odd, and after a moment of Back In the USSR it was obvious that a big old clump of dust was clinging to the stylus. So, what did it take to fix this tech problem? One sharp puff of air directed at the needle. Bam — fixed. How fortunate is it to be a master of the machines, both digital and analog? And it was just a burst of breath that solved their troubles.